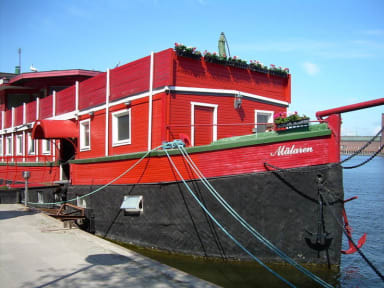 The Red Boat Mälaren, Sztokholm, Szwecja : Rezerwuj teraz! We want one contact person who will fulfil the reservations, for accommodation and breakfast, if wanted. Registration fee (one night payment for the whole group) should be paid 10 days after the reservation has been made. The booking is preliminary until this has been done. The remaining payment should be made latest at the arrival if nothing ells has been agreed. â¢	If you cancel earlier than 30days before arrival, repayment of the registration fee will be done with an exception of an expedition fee of 250sek. â¢	If you cancel the whole group 30 to 15days before arrival, the purchaser (costumer) has to compensate the whole registration fee. â¢	If you cancel the whole group 14 to 4 days before arrival, the purchaser (costumer) has to compensate 60% of the total amount. â¢	If you cancel later than 4 days before arrival, the purchaser (costumer) is obligated to pay the full amount. â¢	If you cancel three days, or less, before arrival a reduction of the group with 10% of the participants can be done without any charge. The reception is open between 08.00am until 11.00pm. The contact person of the group should make sure that the rules of our hostel are followed and also make sure that all keys are returned on departure. 100sek will be charged for every lost key. If any damage has been made the group will be held responsible and charged with the costs of any reparation needed. The cabins should be kept clean, it is not allowed to smoke, drink alcohol, take drugs, eat or make food in the rooms. re-endorsement for the remaining nights. Check out is at 10.00am; if you are late checking out you will be charged one night more without having access to the room. 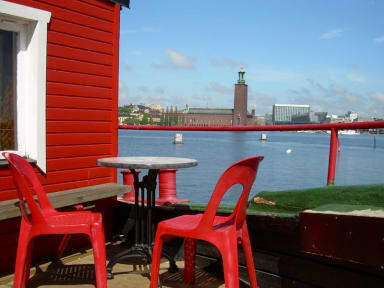 It is located where Lake Mälaren and the Baltic Sea meet, where you can watch boats passing through the lock, take a stroll down the small alleys in the historical Old Town only five minutes walk from the boat, or you can have a beer in one of several pubs on Södermalm. Staying at our hostel you can choose to have a calm and relaxing time or enjoy an eventful stay full of happenings. You can spend the days in one of many shopping areas. If you get tired of that you can visit any of the museums or art galleries close by. During the evening you can go from one pub/club to another without having to spend a lot of time or money getting from one place to another. We also have a small bar in the Hostel reception where we serve beer and wine if you just prefer to stay on the hostel. Our reception is open from 7.30am to 01.00am. Late check in is possible. The hostel is staffed 24/7. When the main doors are locked in the night you will receive a code when you check in, so that you can come and go as you please. (No curfew). We have beds in 10, 4, 3, 2 and single bed rooms. We are sorry to inform you that we do not have cooking facilities due to the risk of fire, but we do have a cafeteria. Showers and toilets are in the corridor for our hostel guests. Before you check in or after you leave you can keep your luggage in our luggage room. We have internet access for our guests free of charge if you use your own computer on our WIFI-net. No Hostel membership is required. There is a parking lot near by us.